POWERFUL FUNCTIONS-Our Bike Hook/Bike Rack is suitable for storage, garage, storeroom, tool room, gardens or just on a bike. As an assistant tool with a wide-mouth, it also helps you greatly in the open air or even when farming. HIGH QUALITY MATERIALS Bike Hanger-Choosing premium galvanized A3 steel with a soft matt plastic coating, non-slip. Our Bike Hook is durable and superior in quality, including good corrosion resistance and oil resistance. SIMPLE INSTALLATION and CLEANING-It is convenient for you to install and hang. Apart from this, you do not worry about pricking your hands. Besides, being easy to clean makes our product a worthy option in daily life. 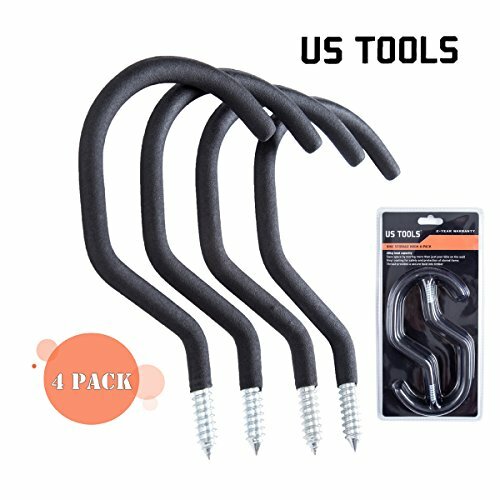 SPACE SAVING - By using this 7" x 4" Tool Hook in the garage, home or wherever you want to store your items, you can take great advantage of space instead of wasting it. If you have any questions about this product by US TOOLS, contact us by completing and submitting the form below. If you are looking for a specif part number, please include it with your message.